Joseph Franklin Hanshaw9,10 [Joseph Franklin Henshaw5,9,11, Joseph M. Hanshaw12]. Hanshaw, Joe F., head-of-household, age 29, born in West Virginia; parents born in West Virginia; first marriage, married 8 years; occupation: farmer, general farm; owned farm (mortgaged). Hanshaw, Martha, wife, age 27, born in West Virginia; parents born in West Virginia; first marriage, married 8 years; 4 children, 4 living. Hanshaw, Madge, daughter, age 6, born in West Virginia; parents born in West Virginia. Hanshaw, Mary B., daughter, age 4, born in West Virginia; parents born in West Virginia. Hanshaw, Charles, son, age 2, born in West Virginia; parents born in West Virginia. Hanshaw, Baby, daughter, age 1 month, born in West Virginia; parents born in West Virginia. Hanshaw, Joseph F., head-of-household, age 44, born in West Virginia; parents born in West Virginia; owned home (free); occupation: farmer, home farm. Hanshaw, Martha E., wife, age 37, born in West Virginia; parents born in West Virginia. Hanshaw, Madge, daughter, age 16, born in West Virginia; parents born in West Virginia; attended school. Hanshaw, Mary B., daughter, age 14, born in West Virginia; parents born in West Virginia; attended school. Hanshaw, Charles M., son, age 12, born in West Virginia; parents born in West Virginia; attended school. Hanshaw, Easter M., daughter, age 9, born in West Virginia; parents born in West Virginia. Hanshaw, Barbara A., daughter, age 6, born in West Virginia; parents born in West Virginia. Hanshaw, Thomas, son, age 4, born in West Virginia; parents born in West Virginia. Hanshaw, Maxwell F., son, age 2, born in West Virginia; parents born in West Virginia. Hanshaw, Joseph F., head-of-household, age 48, born in West Virginia; parents born in West Virginia; first married at age 22; owned home ($5000 value); no radio in home. Hanshaw, Martha, wife, age 46, born in West Virginia; parents born in West Virginia; first married at age 20 [unclear]. Hanshaw, Madge C., daughter, age 26, born in West Virginia; parents born in West Virginia; divorced, first married at age 19. 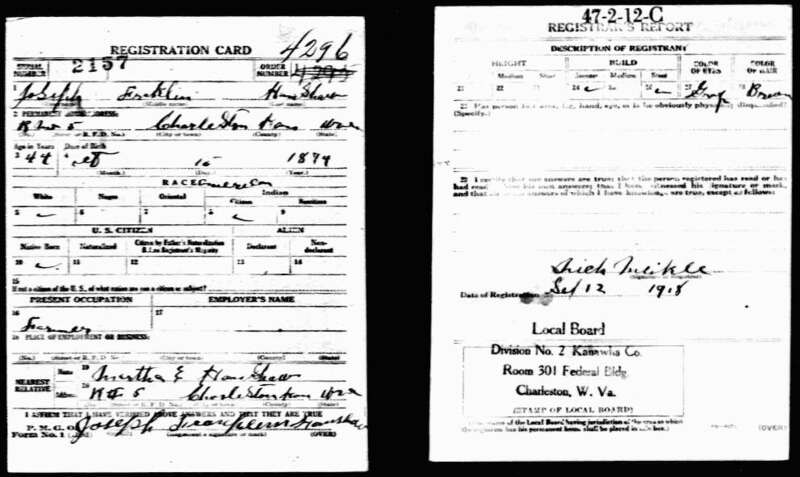 Hanshaw, Charles M., son, age 22, born in West Virginia; parents born in West Virginia. Hanshaw, Easter, daughter, age 19, born in West Virginia; parents born in West Virginia. Hanshaw, Barbara, daughter, age 16 years ? months [unclear], born in West Virginia; parents born in West Virginia; attended school. Hanshaw, Thomas, son, age 14 years 4 months, born in West Virginia; parents born in West Virginia; attended school. Hanshaw, Maxwell, son, age 12 years ? months [unclear], born in West Virginia; parents born in West Virginia; attended school. Hanshaw, Pauline, daughter, age 9 years 11 months, born in West Virginia; parents born in West Virginia; attended school. Hanshaw, Marjory, daughter, age 6 years 7 months, born in West Virginia; parents born in West Virginia; attended school. Hanshaw, Allen, son, age 4 years 10 months, born in West Virginia; parents born in West Virginia. Connor, Kenneth W., grandson, age 5 years 1? months [unclear], born in West Virginia; parents born in West Virginia; attended school. Connor, William E., grandson, age 4 years 1? months [unclear], born in West Virginia; parents born in West Virginia. Henshaw, Joseph, head-of-household, age 62, born in West Virginia; completed 8th grade; on Apr 1 1935 was living in rural Kanawha County, West Virginia; owned farm ($600 value); occupation: farmer, own farm. Henshaw, Martha, wife, age 48, born in West Virginia; completed 8th grade; on Apr 1 1935 was living in rural Kanawha County, West Virginia. Henshaw, Charles, son, age 32, born in West Virginia; completed 8th grade; on Apr 1 1935 was living in rural Kanawha County, West Virginia; occupation: vulcanizer, tire shop. Henshaw, Daniel, son, age 18, born in West Virginia; parents born in West Virginia; completed 3 years of high school; on Apr 1 1935 was living in rural Kanawha County, West Virginia; occupation: farmer, father's farm; no Social Security Number. Henshaw, David, son, age 14, born in West Virginia; completed 1 year of high school; on Apr 1 1935 was living in rural Kanawha County, West Virginia; attended school. 1910 census, Fairview Precinct, Elk District, Kanawha County, West Virginia; roll T624-1685, ED 79, page 7A, line #44, dwelling #118, family #118. 1920 census, Mink Shoals Precinct, Elk District, Kanawha County, West Virginia; roll T625-1957, ED 117, page 11A, line #18, dwelling #95, family #96. 1930 census, Charleston, Kanawha County, West Virginia; roll T626-2537, ED 36, page 21B, line #68, dwelling #446, family #493. Obituary of Maxwell Franklin "Max" Henshaw. 1940 census, Springfield Township, Gallia County, Ohio; roll T627-3072, ED 27-25, page 5A, line #36, household #79. Maxwell Franklin "Max" Henshaw death certificate. Obituary of Daniel S. Henshaw. Contribution from Cindy (Henshaw) Horton. 1900 census, 2nd Ward, Charleston, Kanawha County, West Virginia; roll T623-1762, ED 45, page 19A, line #30, dwelling #384, family #395. 1880 census, Union District, Clay County, West Virginia; roll T9-1401, ED 24, page 312B, line #16, dwelling #42, family #42.